It has been an emotional year for the University of British Columbia. As budgets moved from Central, the Truth and Reconciliation Commission of Canada launched Honouring the Truth, Reconciling for the Future. The residential university and college take on new meaning. As we launched the celebration of our Centennial at UBC 100, our President resigned under a cloak of secrecy. As we began to party, we launched an investigation to discover the lengths to which a Chair of the Board of Governors and administrators might go to suppress academic freedom. Now, as we march to Convocation, students and alumni launch evidence that UBC is failing to properly respond to sexual assaults on campus. In the meantime, terrorists and terror struck Sharm el-Sheikh, Beirut and Paris while the dogs of war howl for bombers and drones to command from the skies above. Increasingly larger regions of the world live in a state of emergency. It’s difficult to know where this University now stands or what it stands for. To take a stand symbolic of peace and reconciliation, please lay down the mace for ceremonies and Convocation. Please put away the coat of arms and lay down the mace. If not for good, then how about for peace? It is time to retire this symbol of aggression, authority and war. It’s time to march to graduation ceremonies this week with open and empty hands as symbolic of peace and reconciliation of controversies and roles of the President’s Office. UBC’s mace is a relic but a relic of what? The mace is symbolic speech but what is it saying about us now? From ancient times, this club, this weapon of assault and offence, the mace was gradually adorned until the late twelfth century when it doubled as a symbol of civil office. Queen Elizabeth I granted her royal mace to Oxford in 1589. From military and civil power derives academic authority. The rest is history and it is not all good. 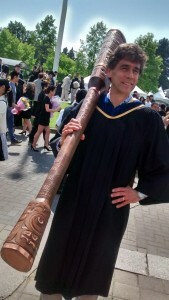 Dr. Thomas Lemieux, School of Economics, with UBC’s Mace at the May 2015 Convocation. It is time to retire the macebearer, whose importance is inflated every year by the image’s presence on UBC’s graduation pages leading to Convocation. In pragmatic terms, if the mace falls into the hands of the wrong macebearer or manager at this point, someone’s liable to get clocked with it. Is UBC’s mace still a respectable appendage to Convocation? Remember, since that fateful November day in 1997, just five months into your Presidency, when student activists put their bodies and minds on the line at the APEC protest, Tuum Est adorns both the can of mace sprayed in their eyes and the ceremonial mace that the President’s Office is eager to carry across campus every November and May. That’s “too messed,” as the students say. Is it not time to retire both?